For this guest blog, I’m thrilled to present one of my writing group buddies: Chele Cooke, a kickass genre author and all-round awesome person. 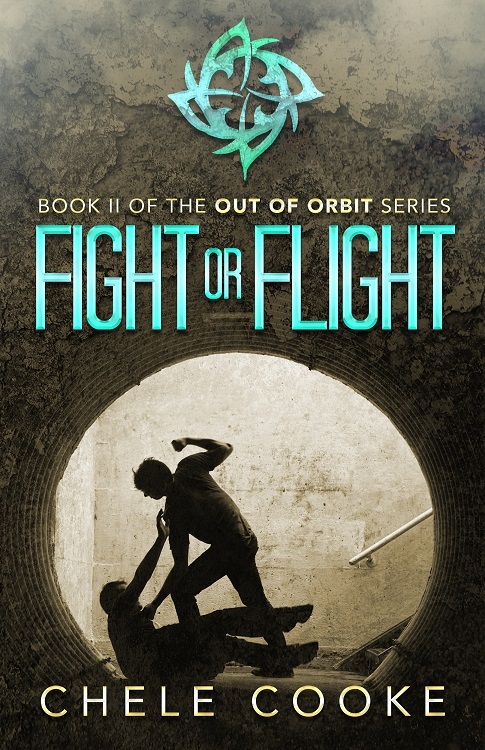 Chele’s latest novel, Fight or Flight, Book Two of the Out Of Orbit series, is out now. You can get a taste of the world by downloading a free e-book of Dead & Buryd, the first novel in the series, or you can read an extract below. Chele is also raffling off 25 copies of Fight or Flight, so scroll down to get to the giveaway! Chele Cooke is an English-born writer based in London. Starting out writing fan fiction, she soon moved onto her own fiction, releasing her first novel, ‘Dead and Buryd’, in 2013, the sequel ‘Fight or Flight’ following less than a year later. She is currently working on The Out of Orbit series, a number of short stories, a circus based sci-fi, and a paranormal serial currently released weekly on Wattpad. She’d been waiting to see him. Every day in the compound, especially since his note had arrived, she had thought of seeing him again. Keiran reached out first, his fingers on her jaw, gently brushing the bruise on her cheekbone. He drew her forwards and placed a soft kiss on her forehead, her temple, her cheek and then the corner of her lips. She turned towards him then, settling her lips against his tender flesh. His fingers disappeared into her hair, holding the nape of her neck as he urged her up to him, sharing breath, sharing longing. His lips tasted of wheat beer and yapoque smoke. He’d been worried. She could imagine him standing outside the Trade Inn, smoking while he waited before coming inside to get a drink. The taste of him was sweet against her tongue. His skin was smooth and warm, just the way she remembered it. His fingertips pressed into the small of her back, pulling her closer. She gripped his arms and clung on, hoping she hadn’t been imagining it all, scared he might evaporate into the smoke of his cigarettes. Next to them, Halden cleared his throat. Georgianna pulled back. Maybe Keiran had done enough to earn Halden’s approval, but she doubted anything was enough for an extended display of affection. The problem was she wasn’t ready to put any space between them. Weeks of thinking of him, wondering whether he was safe, if he really was going to help her, had built up into a pit of longing that had not yet been filled. The tip of her nose bumped against his and he placed another soft kiss at the corner of her lips. She slid her hands up to his shoulders and pulled herself against him, her cheek against his as she hugged him tightly. Keiran’s arms wound around her waist, kissing her temple again. When he moved back, the anxious expression was gone, replaced by critical examination. His gaze swept across her face, down her neck and back to the injury on her cheek. She shook her head. His thumb brushed against her cheek again and behind his frown, she could see his jaw tightening. Georgianna grasped his wrist. She avoided looking at either of them. Enter the giveaway for a chance to win a free copy of Fight or Flight! Claire has read 3 books toward her goal of 80 books.